We dressed up as characters from the original Willy Wonka film to attend Mickey’s Not-So-Scary Halloween Party at Disney World. I went thrift store-shopping to collect the materials to make the Willy Wonka Group Costume for Veruca Salt, Mike Teevee, Violet Beauregard, and an Oompa Loompa. The costume for Veruca Salt is actually made up of 3 different pieces and took the longest to make. I found a red dress and cut it up and restitched it to achieve the flared bottom. I also stitched in a strip of stretchy black fabric for the waistband. The white ruffle collar and cuffs were taken from a shirt I also found at the thrift store. The cuffs were sewn into the costume while the collar was attached using snaps since the rear zipper to the dress rendered the front enclosure of the collar useless. To complete the dress, I sewed on black buttons to the front. I also spray-painted a Styrofoam egg gold for Veruca to hold. This costume cost around $10-15. The costume for Mike Teevee was perhaps the easiest to make. I took a white shirt and dyed it yellow. Then using a glue gun, I carefully attached the white fringe around the shirt. Though you can’t see the hat, I took a straw hat and spray-painted it dark brown. I achieved the look of the wig by cutting the hair to the appropriate length and using brown spray paint to both create the color and keep the hair from moving. This costume cost about $10. The costume for Violet Beauregard was also simple to make. I decided to show her in the beginning stages of blowing up into a blueberry. I found a blue parachute-material jumpsuit at the thrift store. I then created velvet cuffs and a collar from scratch and attached them to the jumpsuit. The belt had to be spray-painted the appropriate red and gold colors. To achieve the puffy look, I took a white tank top and stitched in sheets of cotton batting, and this puffed undershirt was then worn under the costume. This costume cost around $7. 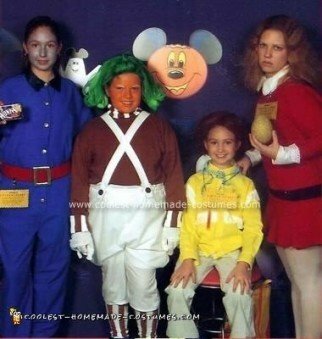 The coolest costume of all and the one that got the most looks was that of the Oompa Loompa. I found a brown turtleneck and white baggy pants at the thrift store. For the shirt, I used white fabric paint to create the white stripes on the collar and cuffs. I cut up the pants and used the leftover material to create the suspenders. The pants themselves had to be restitched to create a narrow, capris-length leg below the knee and a poofy effect above the knee. I sewed shoulder pads into the pockets of the pants to make the sides stay sticking out. I found large, brown buttons to use for attaching the suspenders to the pants. The socks are actually white tube socks with brown stripes painted on them. And though you cannot see them, I created brown and white yarn pom-poms to attach to the shoes. The wig was spray-painted green and curled to get the right shape. This costume cost $15-20 to make. You also may notice the Golden Tickets that Veruca, Mike, and Violet are holding. I got the phrasing and font style/size from the movie and created those on my computer. The wording was printed onto a full-page clear sticker sheet and then attached to gold foil paper. I then cut the edges to achieve the scalloped look of the tickets from the movie. In all, the entire look of all of the Willy Wonka Group Costume cost about $50 and took around 2 weeks to create. Fantastic job! I can’t believe this only took $50 for 4 costumes – that’s amazing! Keep up the great work. Thanks. It’s all about raiding thrift stores and your own closet. It really is amazing the things you can come up with on a budget when you use your imagination. You really did a great job making all those costumes and yes, I’m going to use your ideas for the Oompah Loompah. I am doing a compatision this month and we are doing a little play for one thing and we are doing Charlie and the Chocolate Factory and we need a violet costume. Do you do free ones for chaos twirlers, it is a majorette group, please type back as soon as possible. In all honesty, I lucked out when I found the jumpsuit for Violet Beauregard at a thrift store. The only adjustments were in the collar, cuffs, buttons, and belt. Just check the thrift stores in your area to see what you can come up with. Sorry I couldn’t be more help. my son wants me to be violet i will probably paint or dye a shirt and belt it. The velvet is a good idea. I too have been making costumes for years from thrift stores that and a little imagination go a long way. I intend to make yarn pompoms for my sons feet. Veruca looks hot as hell! All costumes look so creative, I especially love the Umpa Lumpa. I was starting to get worried that I wasn’t going to be able to make it for my 9 yr old son, but I feel at ease now. Thanks so much for sharing your ideas. I WOULDN’T BE CAUGHT DEAD WEARING AN OOMPA LOOMPA COSTUME! Brave girl!